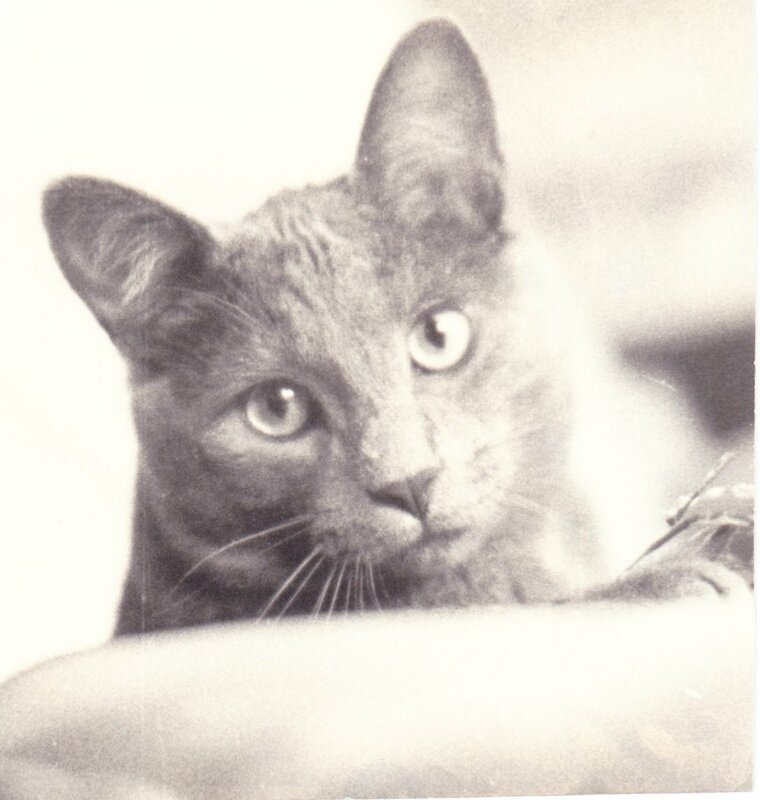 Our late cat Coolidge never had his teeth cleaned, nor was I willing to subject him to such a trauma, until he was 15. His teeth were all in place and found to be without decay, with some tartar. My diabetic 15-year-old Coolidge survived my worst anxiety, the anesthesia. I still felt my now former vet showed poor judgment. I simply do not believe it was worth the risk. Effie is 19 months old, and her breath is sweet and her sharp teeth are white. I thought, and confirmed with our vet’s tech, that it would be good to start getting her accustomed to having her teeth brushed. Even just twice a year would likely waylay the necessity later in life of anesthetized cleaning by the vet. I thought it was worth a try, though I still harbor the observation that cats have lived long and prospered without ever undergoing the trial of having their teeth brushed. Nevertheless, I dutifully picked up this kitty dental kit at Petco today–finger and handle brushes so she has a choice, and chicken-flavored toothpaste. Praise God Effie doesn’t hold grudges. She does, however, make her preferences clear. She also has a way of communicating that she is appalled with my incomprehensively insulting suggestion, and it must be retracted at once and never repeated. Acknowledged. Purina is not likely to make kibbles that will destroy a cat’s ability to eat kibbles. Effie eats both kibbles and a high-protein, low-carb tinned food. Who wants to see a grin without a cat anyway? An idea whose time evidently has gone, at least until symptoms demand its return. I cannot believe you would demonstrate such misapprehension of my sensibilities. . . ! Human, human, thy name is so Mud. Coolidge lived a life of protected luxury and taxing health challenges for the 17 years we were blessed to enjoy his company and inspiration. He inspired my two volumes of poetry, Glamorgan’s Tales and Glamorgan: He Who Would Be Cat. He was the inspiration behind my first blog, Mrs. B and the Cat, that I started in 2006; it morphed in 2007 to Oikos mou, and finally this blog in 2010, when we moved from Puget Sound to the Palouse. Coolidge was on board through the entire journey, until his passing four weeks ago, on August 13, 2015, at 3:45 in the morning, in my arms, from advanced renal failure. Coolidge was diabetic for the past nine years. Every day of those years, at 6:30 AM and 6:30 PM, I tested his glucose and gave him an appropriate dose of insulin. He developed hyperthyroid, a very sinister condition for cats, in his seventh diabetic year. I put methimazole cream in his ear twice a day. When he first became diabetic in 2006, he developed hepatic lipidosis and needed a feeding tube for nine weeks. He yanked it out so many times we quit taking him to the vet’s ER. My husband simply stitched the tube back in place when Coo pulled it out. After all, our cat could not know the tube was where his belly snacks came from. I cooked chicken breasts, pulverized them in a food grinder, and syringed the food into the feeding tube six times a day. Coolidge wore a body sock, supposedly to secure the tube. We called him Coodini, for his way of slipping off the sock so cleverly over his head. Y2K wasn’t Coolidge’s best year, either. He was two, and he somehow broke his hock on a routine indoor prowling mission. A veterinary orthopedist operated and put his foot in a cast for 10 weeks. He had to remain in a kennel cage in the house to keep from running, jumping, or using the stairs. I put an advent calendar up on his cage so I could better stand my poor cat’s captivity. It wasn’t much help. Coolidge was born into a feral pride behind a travel agency on Vashon Island, Washington. Once rescued, Coolidge was always an indoor cat. I had promised his rescuers, the Vashon Island Pet Protectors heroines, that we would not subject him to the hazards of the outdoors, and we kept our word. He had lungworm and a hernia from a raccoon gash when he was rescued at four weeks. He was the sort of kitten I could dedicate my life to keeping safe. He wasn’t always cooperative. But a ripe age and natural causes, as horrible as renal failure is, presented God’s challenging assignments in a gracious light, and we were given the motivation to take up each new challenge. Coolidge was a trooper and an unforgettable companion. He’s a hard act to follow. But little spritely Effie is taking up Coolidge’s charge as her peoples’ champion. I adore her to pieces. She’s no replacement–she’s the Cat of the House. God’s mercy astounds me.